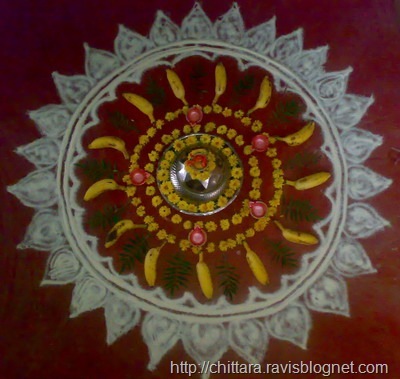 Maha Shivratri or Maha Sivaratri or Shivaratri or Sivaratri (Night of Shiva or "Great Night of Shiva") is a festival celebrated every year on the 13th night/14th day in the Krishna Paksha (waning moon) of the month of Maagha (as per Shalivahana or Gujarati Vikrama) or Phalguna (as per Vikrama) in the Hindu Calendar (that is, the night before and day of the new moon). 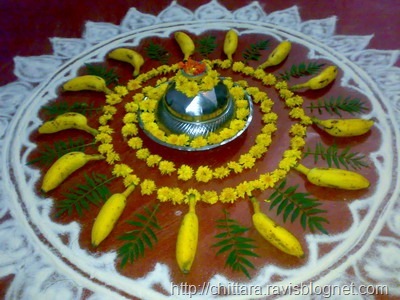 The festival is principally celebrated by offerings of Bael (Bilva) leaves to the Lord Shiva, all day fasting and an all night long vigil. 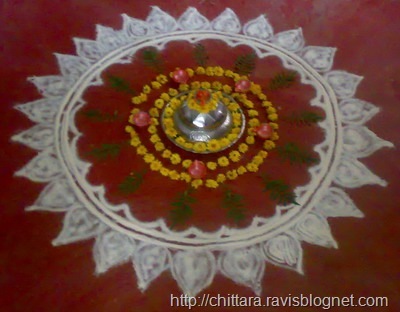 Cannabis is traditionally used as an offering for Lord Shiva and his followers. 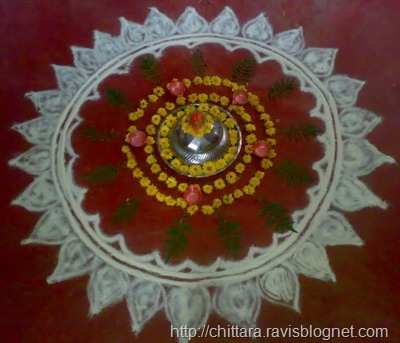 This festival is celebrated with Upavasa (Not having food) and Jagarane (Do not sleep all night doing devotional Bhajans). 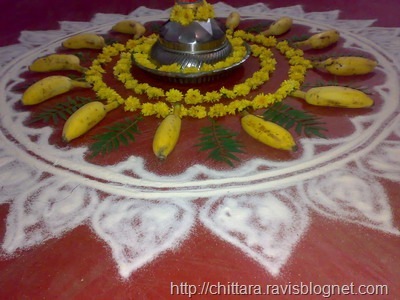 Being a Upavasa Day people might prepare and have food items which doesn’t contain rice and can have fruits. 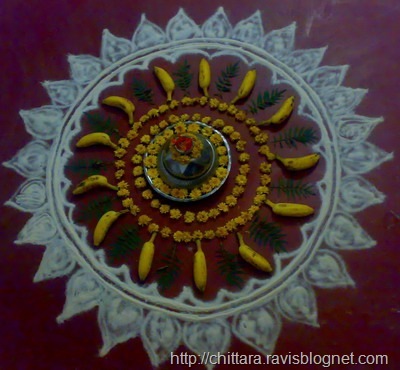 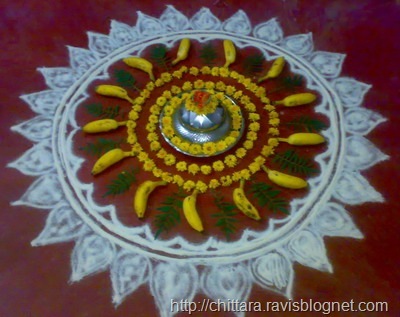 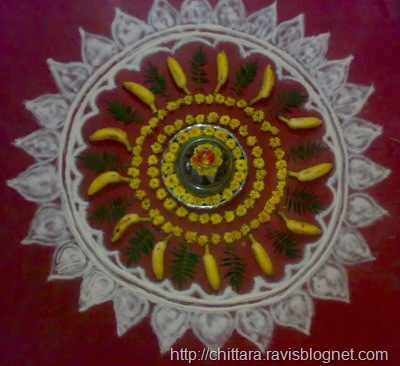 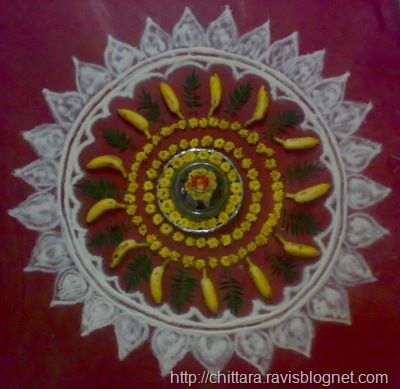 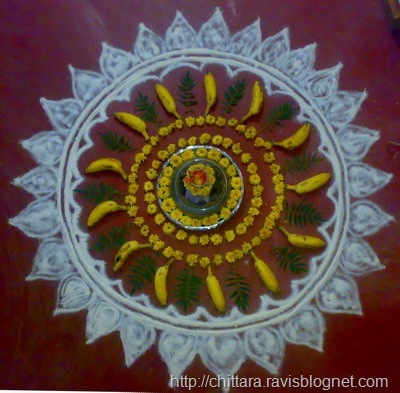 Here is the Rangoli using the non-rice food items (Chiroti rava floor) and Banana Fruits. 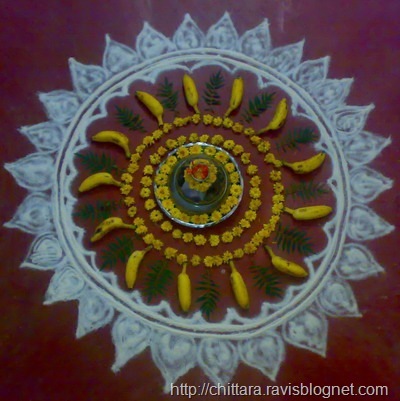 Per scriptural and discipleship traditions, the penances are performed in order to gain boons in the practice of Yoga and meditation, in order to reach the goal more swiftly and avoid rebirth.